For its high position on the hills, Ravello is famed for its magnificent views as well as its very beautiful gardens and smartness. It attracted world-renowned figures such as Wagner and Virginia Woolf and is still a draw for tourists flocking here. 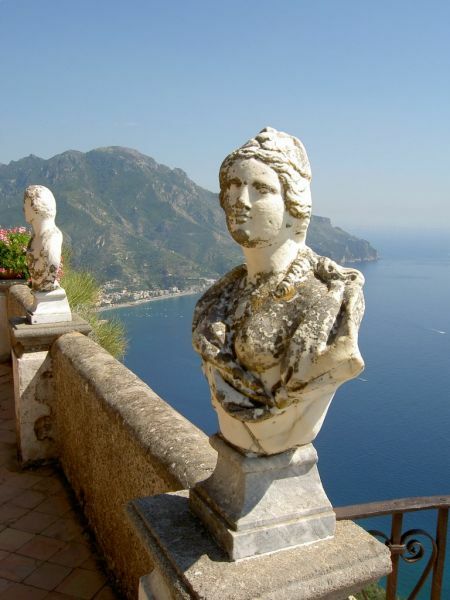 It is possible to at least come to Ravello on a day trip but much of its atmospheric beauty will be left out. The cathedral is on Piazza Duomo. Its building was erected in 1086 but has been repeatedly modified. The central bronze door was incorporated in 1179 and its façade in the 1500s. In the last part of the 20th century its interior underwent modifications which tried to stick to what the cathedral’s appearance must have been when built originally. Take your time to observe the magnificent pulpit sitting on convoluted columns based on marble lions and sporting mosaic figures of animals. The floor slopes to Piazza Duomo which improves the perspective. There is a museum underneath the cathedral displaying religious pieces. Villa Ruffolo was constructed in the 13th century by the rich family Rufolo and was residence of popes and a king. Its stunning gardens were designed in the middle of the 19th century and inspired Wagner with its beauty. The garden gives precious views filled with all colours of a palette. At present the villa plays host to a classical music festival. To the east of Piazza Duomo is Villa Cimbrone which was built at the beginning of the 20th century. The views from its gardens have been considered by some the prettiest in the world. The gardens can be enjoyed from the Belvedere of Infinity which is a stunning setting bordered by reproductions of classical busts. The setting and its views are just a gift from the gods. The tourist information office can provide maps of the strolling paths around Ravello and the ones connecting it to other towns. There are paths to follow through the Lattari Mountains known in the Antiquity. A path down the hill leads to Scala, a place dotted with over 100 churches which now lies dormant. Its 12th century Romanesque Duomo on Piazza Municipio deserves a visit. The Ravello Festival infuses the town with a festive halo from June to mid September. Villa Rufolo and other open air settings play host to orchestra concerts, ballet performances, exhibitions and film shows. Concerts are not only put on in the summer but from March to October. It reaches its peak in the International Piano Festival and Chamber Music weeks when the cream of the Italian and worldwide artists gather to turn Ravello into the great attraction of music lovers in June and September. www.Ravelloarts.org may provide more information and book tickets for the concerts. At the end of July Ravello celebrates the day of its patron saint San Pantaleon with entertainment and displays of fireworks. The tourist information office is located on Via Roma. It supplies a practical pamphlet with a map, information about recommended strolling paths to discover its beauty and historical information. While shopping you will stroll by plenty pf shops selling the local souvenir: ceramics and lemon liqueur. Medea specializes on ceramics giving shape to endless number of elements from lamps to vases and many more. Beware a designer vase may cost about € 12,000. At Profumi della Costiera limoncello is made and purchased with the guarantee that no preservatives and colouring has been added. Prices at bars, cafes and restaurant will almost certainly be high. Some hotel restaurants are available for outer guests. Trattoria Cumpà Cosimo on Via Roma offers dishes prepared with home grown vegetables and fruit, homemade wine, meat from the family butchery and handmade pasta. Ristorante Palazzo della Marra on Via della Marra is set in a renewed 12th century palazzo. There the local dishes and desserts have been given a creative brand new touch. BY BUS: From Amalfi leaving from Piazza Flavio Gioia (length: 25 minutes).